Deb Willner pulled her bike off the stand at Community Bikes in Santa Rosa and settled up. She'd trued her wheel, adjusted her derailer, straightened her chain ring, mounted a bottle cage and replaced a seat post by herself—all with the use of the nonprofit's parts and tools. "It'll be $32," said Cole, the weekend manager, somewhat reluctant to even charge Willner at all. "Aw, I'll go out and get you something, too," Deb offered. "You want something sweet? Chocolate?" Public generosity and baked goods are not uncommon at Community Bikes, the little shop with a big community spirit that offers anybody and everybody the chance to learn how to work on their bicycle for just $10 an hour, all tools and expert guidance included. For those short on cash but eager to experience Sonoma County's legendary cycling routes, the volunteer-run shop carries hundreds of used bikes and shares the skills to fix them. If something's not quite right on the bike of one's dreams ("Front shifter is weird," reads a price tag on a red Schwinn), there's most likely an inexpensive used part to fix it stored in one of dozens of packed milk crates lining the perimeter of the shop. "All the bikes here are donated, so they can come in any state of repair," Cole says, estimating that 90 percent of donations are salvageable. At any given time, there's usually a half-dozen regular people doing just that, be it replacing a hub, wrapping handlebars or regreasing a bottom bracket. 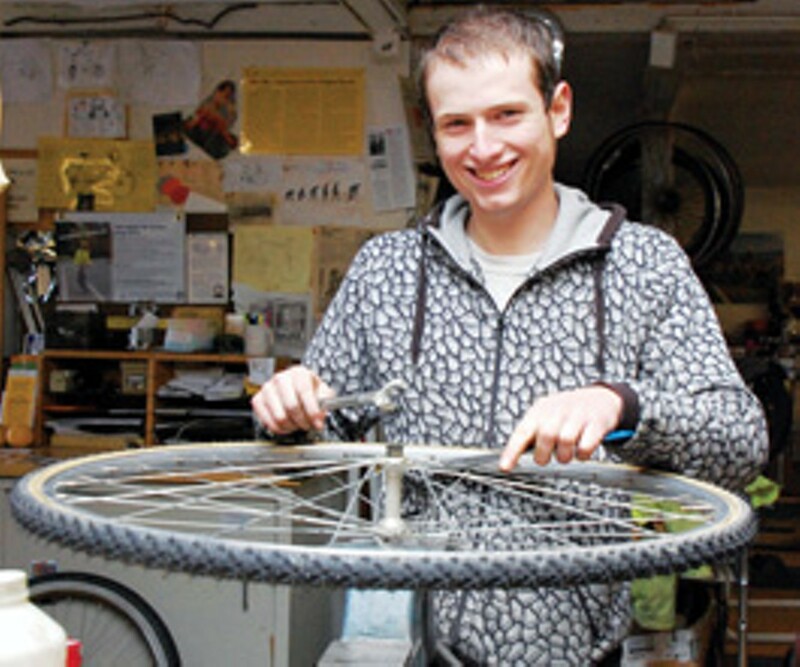 Conventional bike-shop service workers might shudder, say, at the stock of used, frayed brake cables (like everything else, they get reused), but since opening in 2004, Community Bikes' patch-it-together, do-it-together philosophy has worked just fine for the average cyclist. "They're really good to homeless people, too," adds Willner, arriving back from the store with food in hand. Turns out the volunteers at Community Bikes prefer bananas. "And look at my bike, all fixed up. For $32 and a few bananas, that's a pretty killer deal." 4019 Sebastopol Road, Santa Rosa. 707.579.5811.—G.M. The coolest thing to do in Rohnert Park is golf, but not with woods and irons. The best course is actually just outside the city, and it requires Frisbees. The Steve Werner Memorial Disc Golf Course at Crane Creek Regional Park is a five-minute drive from Sonoma State University, and the 18-hole hike can take 20 minutes to two hours to finish, depending on the golfer's mood. The course is free to all (there's a $6 Crane Creek parking fee), and like the park, it's open sunup to sunset. The beautiful scenery can be mesmerizing, from 100-year-old oaks to miles of agriculture untouched by the bulldozers and cranes of development. For nongolfers, the occasional jingle of a disc hitting the metal chain and basket can seem a strange addition to chirping birds, rustling tall grass and bellowing bovine. But soon the sound blends in as part of the nature of the park, and the air doesn't seem complete without it. 5000 Pressley Road., Rohnert Park. 707.477.2468.—N.G. The perfect climate for winemaking also happens to be the perfect climate for olives, and in the rolling hills just west of Petaluma, on 550 acres, sits the privately owned McEvoy Ranch. Once a dairy farm, it's been reincarnated as an organic olive tree orchard by the iconoclastic Nan McEvoy, who purchased the land in 1991. What began with a thousand imported Tuscan seedlings is now a thriving orchard responsible for award-winning McEvoy olive oils, widely considered to be among the best in the country. Arguably the most beautiful piece of ranch land in the area, McEvoy's views, vistas and horticulture are breathtaking. Access to this pastoral sanctuary is rare, but the ranch does offer a dozen or so tours and workshops to the public every year. "Once you see it for yourself, you realize how special it is—the land really speaks for itself," says Jill Lee, the ranch's tour manager. Events scheduled this year include orchard and garden walks with tours of the mill and olive press, plus a series of more specialized sessions devoted to birding, olive pruning and organic garden-to-table cooking. Many of the classes and tours include an olive oil tasting and-or a light meal; all include a primer on the ranch's colorful history and the opportunity to visit the otherwise shuttered ranch store. For reservations, keep close tabs on McEvoy's website, where events are posted a couple months in advance. www.mcevoyranch.com.—K.F. Spas are nothing new around here. From Boyes Hot Springs to Calistoga, health seekers have long traveled from afar to soak their bones in miracle mineral waters that burble unbidden from fissures in this volcanic region. In fact, there may be far more entirely off the map: "ghost spas." High above Calistoga, down a forest path, above a mountain stream shaded by redwood and pine, is a series of disused concrete bathtubs. Following some rusted pipes up the hill, one finds a deep pool of sulfurous water at a constant temperature of 85 degrees Fahrenheit. When the Orth family founded Mountain Home Ranch in 1913, they found the pool had already been enlarged out of the rock by Native Americans, who also built redwood logs around this sacred healing spot. Later, the Orths added concrete and bathhouses. According to current owner Suzanne Pasky Fouts, the resort's brochure from the 1920s "talks about healing old diseases that you don't even hear about anymore. People used to bring gallon jugs home with them." After a 1964 forest fire, the rustic "spa" was never rebuilt, but guests of the ranch are welcome to go for a soak—if they don't mind that the goats drink from it, too, preferring it to the cold clear water of the nearby creek. Are the goats on to something? Pasky Fouts says that one of her goats is going strong at 16. "And that's pretty old for a goat." 3400 Mountain Home Ranch Road, Calistoga. 707.942.6616.—J.K. The hidden grove of daffodils in the Point Reyes National Seashore is one of those beloved secret spots that locals protect with intense ferocity. So newcomers, grab a pencil—I'm about to spill the beans. The unmarked trail that leads to this flora-filled clearing can be found by following Limantour Spit Road to the Point Reyes Hostel. There, alongside the dirt drive about 30 feet from the hostel's front door, you'll spy a very narrow trailhead leading into the brush. The path to the daffodils is a veritable obstacle course and requires traversing a narrow, slippery bar to cross a rushing stream some six feet below; scaling a leaning tree trunk followed by a steep embankment using a rope left by previous explorers; and holding one's arms skyward to avoid the constant threat of poison oak or wild nettles, both of which grow abundantly along the trail. If you survive this short but perilous hike, and pick the right week in February (usually toward the end of the month) to make the trek, you'll be rewarded with a glorious blanket of daffodils that reach deeply into the surrounding thicket as far as the eye can see. Rumored to be a remnant of a bulb farm that once operated there more than half a century ago, the grove is—or rather was—one of Point Reyes' best-kept secrets. Along the Laguna Trail; begin at 1390 Limantour Spit Road, Point Reyes Station.—K.F. Heavy rain falls outside, but the studio is warm and smells of Teen Spirit. Nine young women warm up in a variety of outfits: yoga pants, shorts over tights, a ruffled layered dress with striped leggings, tank tops with Analy Tiger sweats, skinny jeans and a hoodie, knee pads, ankle socks or bare feet. Julie Marques, owner of Sebastopol's Core in Motion Dance Studio counts out beats, singing the numbers like an Indian raga. Feet slide sideways, arms fly up and out. "Pull up and open, like you're tearing some cardboard," she instructs, "and look while you tear." One move resembles patting down of a bowl of dough with both hands, another, a waitress carrying a dish at shoulder height. "Pull, pull," Marques calls, and the dancers haul in an imaginary fishing net. The music and moves pick up tempo, and smiles increase as the teens watch themselves in the wall of mirrors. Bollywood dance combines the styles of ballet, yoga, hip-hop, folk and classical Indian dance. Requiring a sense of balance and precision movements, the dance involves every part of the body, including facial expression. Marques, a 10-year veteran of Bollywood dance, studied a variety of dance styles in India and Nepal for almost three years. "The classical Indian dances combine spirituality and movement, but Bollywood is more spoofy, a relief from formal religious pieces," Marques explains. Fast-forward a week later, to a sunny afternoon, as nine beauties in a rainbow of colorful costumes dance outside in the plaza's gazebo. After the applause dies down and the audience disperses, the smiles continue. "I love the energy of Bollywood dance—it's unique to the style," says dancer Athena Wheaton. "Even the pieces that have attitude are really joyous." 134 Weeks Way, Sebastopol. 707.823.1074.—S.D.